A technique drill this week: angling. The drill starts with two players going at once. The first player skates straight ahead and takes a long loop around the far dot. The second player leaves with a puck and makes a tight turn around the near dot. The first player needs to time his swing to take a great angle on the puck carrier, taking away time and space and shutting him down along the wall. Angling is all about timing and positioning. Body and stick position are critical. When angling, use your body to take away time and space. You need to move your feet to gain and maintain good body position (just off the inside shoulder). Stick position should be up ice – you want to utilize your stick to take away passes against the grain and behind you. 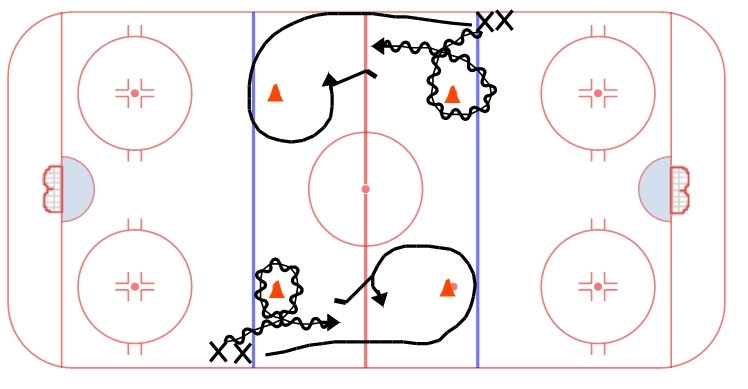 It becomes similar to a slowly collapsing wall – you take away time and space with your body, limiting passing options with your stick until you finally crunch down on your opponent. Angling is a critical skill in the game today. Players who are great at angles become players who are successful in the game.